The United Nations has suspended an anti-polio campaign in Pakistan after three more health workers died in the latest of a spate of gun attacks. Attacks in the Peshawar region killed a female vaccination supervisor and her driver, as well as a student volunteer. Coming after five deaths on Tuesday, the UN said it was suspending its three-day vaccination drive. No group has claimed responsibility, but the Taliban have issued threats against the UN’s anti-polio campaign. Pakistan is one of just three countries where the disease is still endemic. The UN children’s agency Unicef and the World Health Organization were suspending work on the programme nationwide after Wednesday’s bloodshed, said Unicef spokesman Michael Coleman. The programme was halted in Sindh and Khyber Pakhtunkhwa provinces on Tuesday after four female health workers were shot dead in the city, while another female worker was killed in an attack in Peshawar. The vaccination supervisor and her driver died when their car was sprayed by gunmen riding motorbikes in Charsadda district, north of Peshawar, police said. The student volunteer was shot in the head when gunmen on two motorbikes fired at a team of vaccinators in a northern suburb of Peshawar. Gunmen riding motorbikes also shot at polio vaccinators in another area of Charsadda and in the adjoining district of Nowshera, although no injuries were reported. Prime Minister Raja Pervez Ashraf on Tuesday condemned the attacks and praised the work of the polio vaccination teams, calling on regional authorities to guarantee their safety. Wednesday is the final day of a three-day nationwide anti-polio drive – during which an estimated 5.2 million polio drops were to be administered. 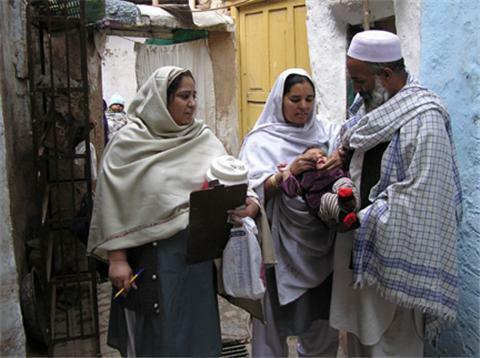 There has been opposition to such immunization drives in parts of Pakistan, particularly after a fake CIA hepatitis vaccination campaign helped to locate Osama Bin Laden in 2011. Militants have kidnapped and killed foreign NGO workers in the past in an attempt to halt the immunization drives, which they say are part of efforts to spy on them. Afghanistan and Nigeria are the only other countries where polio is still endemic. Pakistan is considered the key battleground in the global fight against the disease, which attacks the nervous system and can cause permanent paralysis within hours of infection. Almost 200 children were paralyzed in the country in 2011 – the worst figures in 15 years. Earlier this year, the Global Polio Eradication Initiative warned that tackling the disease had entered “emergency mode” after “explosive” outbreaks in countries previously free of polio. The World Health Organization (WHO) said polio was at a tipping point, with experts fearing it could “come back with a vengeance” after large outbreaks in Africa and Tajikistan and China’s first recorded cases for more than a decade. Declaring polio a national emergency, the Pakistani government is targeting 33 million children for vaccination with some 88,000 health workers delivering vaccination drops.